I love Pinterest.com! Who wouldn’t?! The website is amazing. It’s chock full of ideas, resources, and inspiration. It’s a DIY-er’s dream come true. Allowing its users to share everything from creative crafts, to style secrets, to mouth-watering meals and more, Pinterest has definitely become one of my newest obsessions. I have become such an addict to this virtual pinboard, I could spend hours on end browsing through all of it’s wonder. However, I have to say, I feel as though when Pinterest first became popular a few months ago, it was pure- every pin you came across was eye-catching, remarkable, and made you think to yourself I gotta try that! Now, with a bazzilion-and-one users onboard you start seeing some crap mixed in. For instance, has anyone seen the project that consists of a bunch of crayons lined up on a poster board then blow-dried so all the colors start melting together? I mean, come on… if you’re hanging that on your living room wall as an art form, you have issues! And how about all the “easy as 1-2-3 hairstyles.” Ya know, the ones that claim to simply pull, twist, secure with a bobbi pin and voila you have this adorably cute waterfall braid perfectly encircling your entire head. Let’s be serious, people- we all know you just walked out of a hair salon! Furthermore, some of the recipes, I swear, are pinned by people who were either born congenitally lacking taste buds or who later in life lost their taste buds in some type of freak accident. 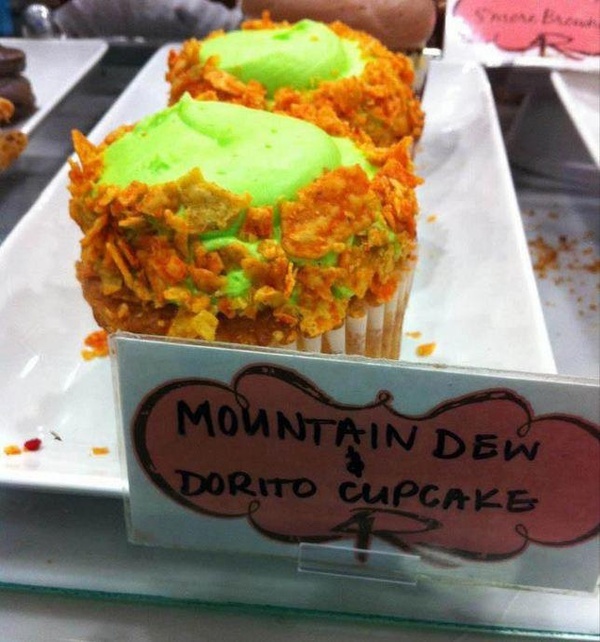 Last night while scrolling down and down and down Pinterest, I came across these Mountain Dew Dorito Cupcakes. b. a college frat boy having just realized there is absolutely no food in the cupboards, not even Ramen noodles. e. my dog, Tide. Those of you who follow my blog know… he will eat ANYTHING. I know I’m being critical, but I just hate seeing such a masterpiece of a website cluttered up with junk. People, there are some pins that should be shared and some that should be hidden deep within your own personal computer’s harddrive. I adapted this recipe for Gorgonzola Lollipops from a pin I came across, and let me assure you, this is one that should definitely be shared! Let the cream cheese come to room temperature, then use a fork to combine it with the crumbled Gorgonzola. Form the cheese mixture into walnut size balls. 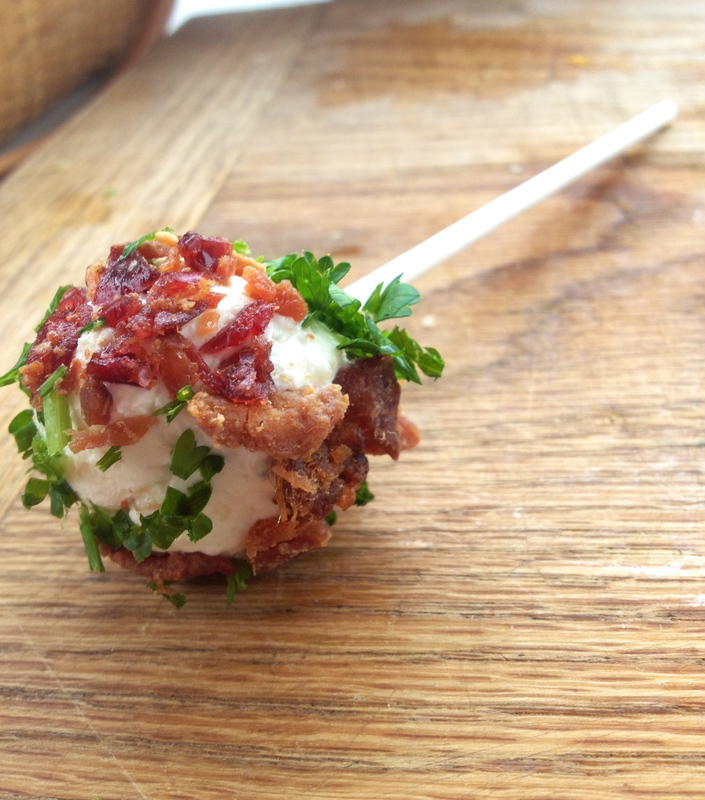 In a shallow dish combine the bacon, craisens, and parsley then roll each cheese ball in it to coat. Refridgerate until ready to serve. For fun you can put them on lollipop sticks. Otherwise just leave them as is and they’re more like a cheese truffle.